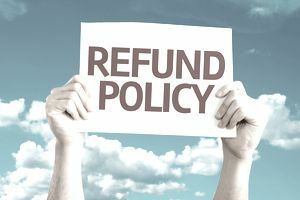 Here's how to create a return and refund form for your retail business. When running a retail store, it's important to have clear policies in place so that everyone, including staff and customers, knows what to expect. With so much emphasis on customer experience in a retail store, one area where you need to be crystal clear is returns. It may seem simple enough: When someone brings something back, you just refund their money, right? Not if you want to stay in business. Retailers have to take steps to protect themselves from return fraud, which costs businesses between $9 billion and $15.9 billion a year, according to a National Retail Federation study. First, make sure you require a receipt for cash returns, period, no exceptions. It's best to offer refunds in the same currency the customer paid, so if they used their Visa card, the refund goes back on that card. With purchases made by personal checks (for those retailers that still take them), the usual protocol is to put a waiting period on any returns, to ensure the check has been paid by the bank. If you plan to offer store credit instead of cash refunds, be very clear to customers at the time of purchase that this is your policy. For example, some maternity clothing stores will only issue merchandise credits for any returns, since there's an obvious time limit on how useful the clothes are to the customer. Decide whether you plan to limit the time window for returns. Some retailers only allow them within 30 days, for instance. Also, have a clear plan for how to handle returns where a customer made the purchase online but seeks a refund at the brick-and-mortar store. Be sure to post your policy in plain view, ideally near the cash register, printed on a customer's receipt, or on your website's shopping cart page. Many states require this by law, and it's just a good business practice to do so. In our shoe stores, we even had fun with the return policy sign. Our return policy said "We will gladly accept returns with a receipt within 60 days of purchase. Stuff without a receipt can be returned for a store credit by completing a tribal council ceremony in which you have to stare us in the eye for 19 seconds without blinking." It was our way of saying, we value the customer experience over haggling. Above all, strive to be consistent in how you enforce your store's return policy. But keep in mind, your best customers deserve some special treatment at times. It's what keeps them loyal and from shopping online versus in your store. In our stores, the first thing an employee did was look the customer up in our system (even before they waited on them) to look for notes and purchase history. Our customers knew that we always looked at their profile and they appreciated it. They knew that the purpose was to not make them have to tell the story about why certain items don't fit right or why they hated certain brands. The employee could simply read what brands they hated and then avoid them. But at all times during a return, we first looked at their purchase history. If they were a loyal customer who had purchased a lot with us, we would be more generous with our policy. After writing a return policy, the next step is to create a document that will allow store employees to quickly and efficiently complete the transaction. You can download Merchandise Return Form templates to use in your retail store or develop your own form. The information obtained from the customer should include some basic customer information, such as name, address and contact details. Some proof of identification should be required, and it should be clear if there's a reason for the return, such as defective merchandise. You don't want to be putting bad products back on your shelves. The form should note what kind of return is being issued; credit card, cash or store credit. Be aware that regulations governing returns and other consumer transactions vary from state to state. It's up to you as the retailer to know what details your business can or cannot collect from the shopper and how that information should be stored. The information collected during the return process can be used in various ways. Store management can give the customer a follow-up call. This may reveal any customer service issues or product concerns the shopper didn't mention during the return process. Retailers will need to keep a record of refund transactions for accounting purposes. Remember, the bottom line is never let your return policy take precedence or priority over the customer experience in your store. It will save you money today, but cost you more money tomorrow.